The King Salman Humanitarian Aid and Relief Center distributed more than 658 food baskets weighing 49 tons for displaced and affected people in Dhale Governorate, benefiting 3,948 individuals. This aid comes within the humanitarian and relief projects provided by the Kingdom, represented by the Center, to alleviate the suffering of the Yemeni people during the current humanitarian crisis. KSRelief also handed over the third batch of medical supplies to Hadramout kidney centers, a 21 ton container containing 1,750 dialysis sessions, in the presence of Hadramout governor Issam Alkatiri. Al-Kathiri confirmed that this batch will help kidney centers in providing services to patients in Hadramout valley and desert and those who frequently visit the centers of neighboring provinces. It is noteworthy that kidney centers in Hadramout received in the course of 2018 two payments of aid from the Center, estimated 56 tons of medical supplies, benefited patients with kidney failure in Hadramout and neighboring provinces. 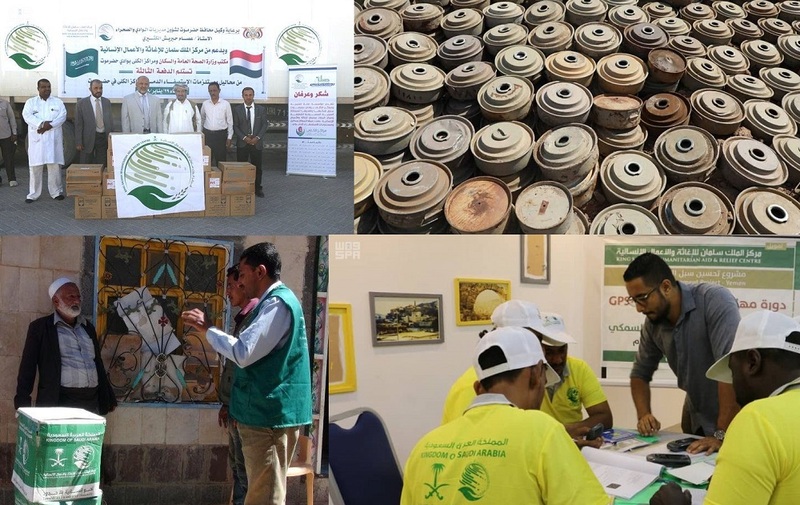 The King Salman Humanitarian Aid and Relief Center managed to remove 7,183 mines, planted by Iranian-backed Houthi militia in Yemen during the fourth week of January 2019. MASAM project removed about 89 antipersonnel mines, 2,322 anti-vehicle mines, 284 explosive devices, and 4,487 unexploded ordnance. The total number of mines have been uprooted since the beginning of the project is 38,817 planted by Iranian-backed Houthi terrorist militias in territories, schools, and houses in Yemen, killing a large number of children, women and the elderly, or resulting in serious injuries or amputation of organs. The King Salman Humanitarian Aid and Relief Center organized also the fourth session of the skills of GPS devices using for Yemeni fishermen in the fisheries sector in the project of improving livelihoods. 25 fishermen received attended training session on the use of the GPS device in order to facilitate the process of fishing, knowledge of wind speeds, wave height and knowledge of the presence of fish. This project comes within the framework of the various projects offered by the Kingdom of Saudi Arabia, represented by the Center, for the Yemeni people in all its governorates without discrimination.